In any game, only certain physical effects are of interest. Rigid body dynamics – the movement and interaction of solid, inflexible objects – is by far the most popular kind of effect simulated in games. That’s because most of the objects we interact with in real life are fairly rigid, and simulating rigid bodies is relatively simple (although as we will see, that doesn’t mean it’s a cakewalk). A few other games require the simulation of more complicated entities though, such as deformable bodies, fluids, magnetic objects, etc. The following is an example of a particle simulation in the C language. // Global array of particles. // in a more interesting application. // Initializes all particles with random positions, zero velocities and 1kg mass. // Just applies Earth's gravity force (mass times gravity acceleration 9.81 m/s^2) to each particle. float totalSimulationTime = 10; // The simulation will run for 10 seconds. float currentTime = 0; // This accumulates the time that has passed. float dt = 1; // Each step will take one second. As you can see, the particle started at the (-8, 57) position and then its y coordinate started to drop faster and faster, because it was accelerating downwards under the force of gravity. Initially, at t = 0, the particle is at p0. 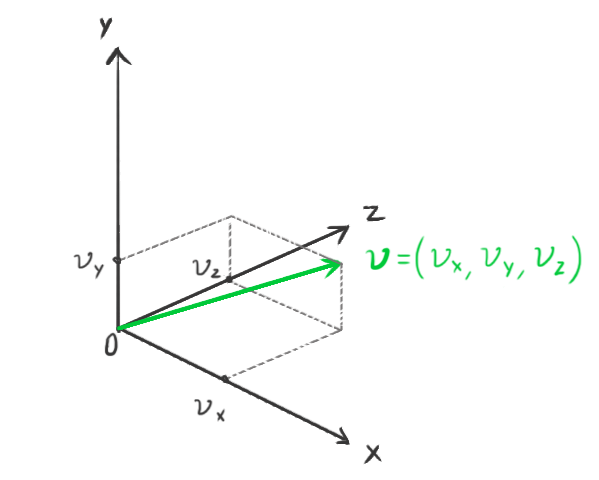 After a step it moves in the direction its velocity vector v0 was pointing. 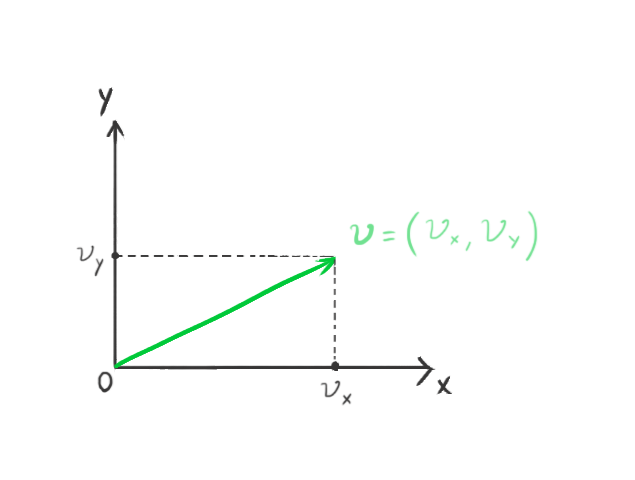 In the next step a force f1 is applied to it, and the velocity vector starts to change as if it was being pulled in the direction of the force vector. In the next two steps, the force vector changes direction but continues pulling the particle upwards. A rigid body is a solid that cannot deform. Such solids do not exist in the real world – even the hardest materials deform at least a very small amount when some force is applied to them – but the rigid body is a useful model of physics for game developers that simplifies the study of the dynamics of solids where we can neglect deformations. A rigid body is like an extension of a particle because it also has mass, position and velocity. Additionally, it has volume and shape, and so it can rotate. That adds more complexity than it sounds, especially in three dimensions. A rigid body naturally rotates around its center of mass, and the position of a rigid body is considered to be the position of its center of mass. We define the initial state of the rigid body with its center of mass at the origin and a rotation angle of zero. Its position and rotation at any instant of time t is going to be an offset of the initial state. This formula shows that the center of mass is the average of the particle positions weighted by their mass. If the density of the body is uniform throughout, the center of mass is the same as the geometric center of the body shape, also known as the centroid. Game physics engines usually only support uniform density, so the geometric center can be used as the center of mass. where r is the position vector of each point, and 𝜌 (rho) is a function that gives the density at each point within the body. Essentially, this integral does the same thing as the finite sum, however it does so in a continuous volume V.
Since a rigid body can rotate, we have to introduce its angular properties, which are analogous to a particle’s linear properties. In two dimensions, a rigid body can only rotate about the axis that points out of the screen, hence we only need one scalar to represent its orientation. We usually use radians (which go from 0 to 2π for a full circle) as a unit here instead of angles (that go from 0 to 360 for a full circle), as this simplifies calculations. 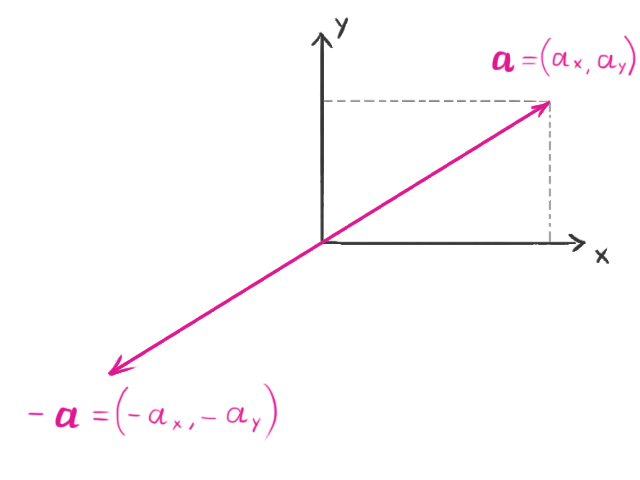 where α (alpha) is the angular acceleration and I is the moment of inertia. where V means that this integral should be performed for all points throughout body volume, r is the position vector of each point relative to the axis of rotation, r2 is actually the dot product of r with itself, and 𝜌 is a function that gives the density at each point within the body. Here you can find a list of formulas to compute the moment of inertia for a bunch of shapes about different axes. where θ (theta) is the smallest angle between f and r.
It’s incredible how adding only one more dimension to the simulation makes things considerably more complicated. In three dimensions, the orientation of a rigid body has to be represented with a quaternion, which is a kind of four-element vector. The moment of inertia is represented by a 3x3 matrix, called the inertia tensor, which is not constant since it depends on the rigid body orientation, and thus varies over time as the body rotates. To learn all the details about 3D rigid body simulation, you can check out the excellent Rigid Body Simulation I — Unconstrained Rigid Body Dynamics, which is also part of Witkin and Baraff’s Physically Based Modeling: Principles and Practice course. // Calculates the inertia of a box shape and stores it in the momentOfInertia variable. // Global array of rigid bodies. // Prints the position and angle of each body on the output. // We could instead draw them on screen. // Initializes rigid bodies with random positions and angles and zero linear and angular velocities. // They're all initialized with a box shape of random dimensions. // Applies a force at a point in the body, inducing some torque. Since an upward force of 100 Newtons is being applied, only the y coordinate changes. 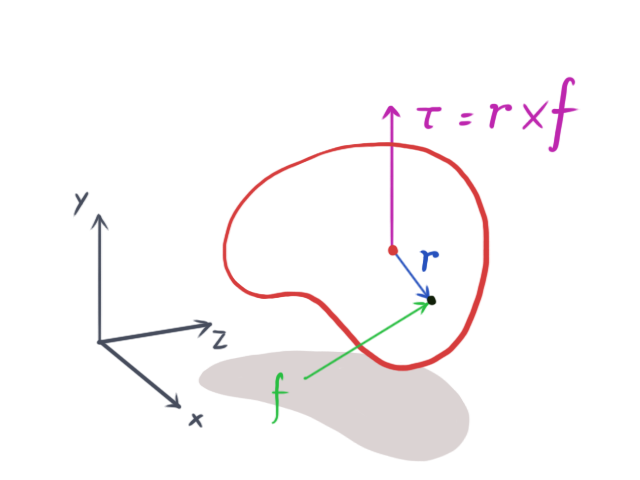 The force is not being applied directly on the center of mass, and thus it induces torque, causing the rotational angle to increase (counter clockwise rotation). The graphical result is similar to the particles animation but now we have shapes moving and rotating. This is an unconstrained simulation, because the bodies can move freely and they do not interact with each other – they don’t collide. Simulations without collisions are pretty boring and not very useful. In the next installment of this series we’re gonna talk about collision detection, and how to solve a collision once it’s been detected. A vector is an entity that has a length (or, more formally, a magnitude) and a direction. It can be intuitively represented in the Cartesian coordinate system, where we decompose it into two components, x and y, in a 2-dimensional space, or three components, x, y, and z, in 3-dimensional space. represents a 2-dimensional vector. Each component is the distance from the origin in the corresponding coordinate axis. 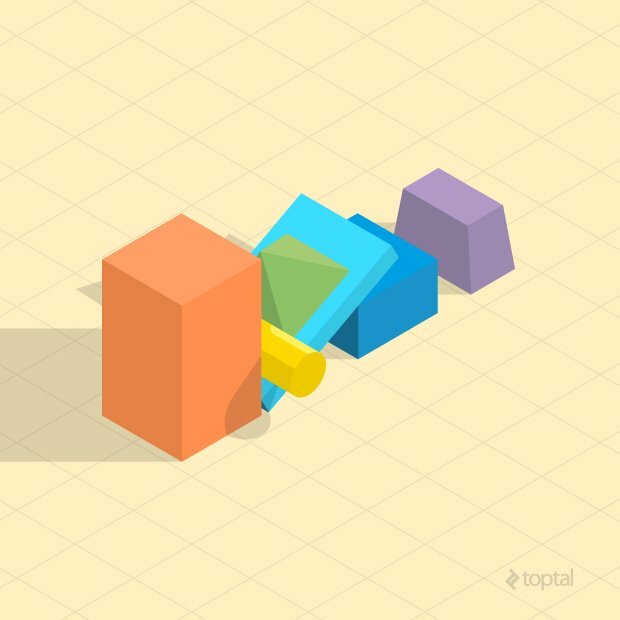 Physics engines usually have their own light weight, highly-optimized math libraries. 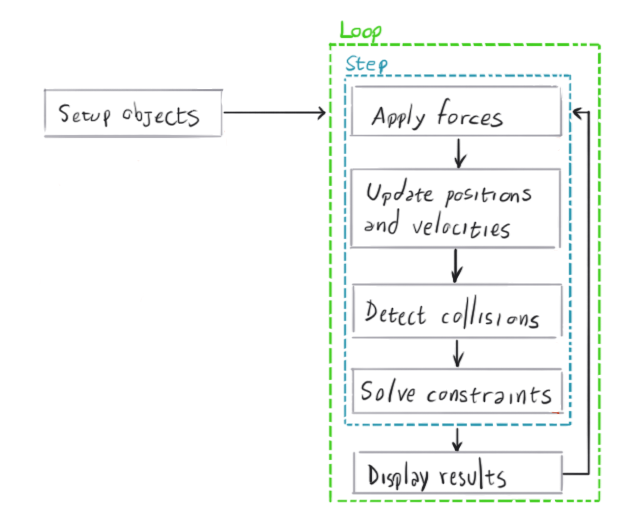 The Bullet Physics engine, for instance, has a decoupled math library called Linear Math that can be used on its own without any of Bullet’s physics simulation features. It has classes that represents entities such as vectors and matrices, and it leverages SIMD instructions if available. Some of the fundamental algebraic operations that operate on vectors are reviewed below. When a vector is multiplied by a scalar (for the purposes of this tutorial, a scalar is simply any real number), the vector’s length changes by that amount. 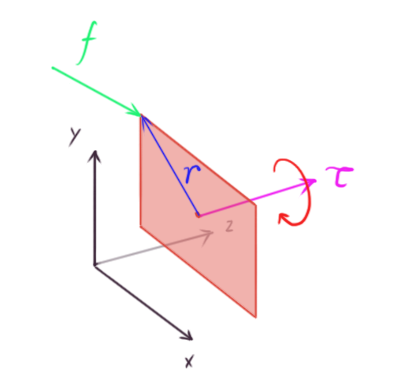 If the scalar is negative, it also makes the vector point in the opposite direction. The value of the dot product is equivalent to the length of the projection of the vector a onto the vector b, multiplied by the length of b. This action can also be flipped, taking the length of the projection of b onto a, and multiplying by the length of a, producing the same result. This means that the dot product is commutative – the dot product of a with b is the same as the dot product of b with a. One useful property of the dot product is that its value is zero if the vectors are orthogonal (the angle between them is 90 degrees), because cos 90 = 0.
where ø is the smallest angle between a and b. 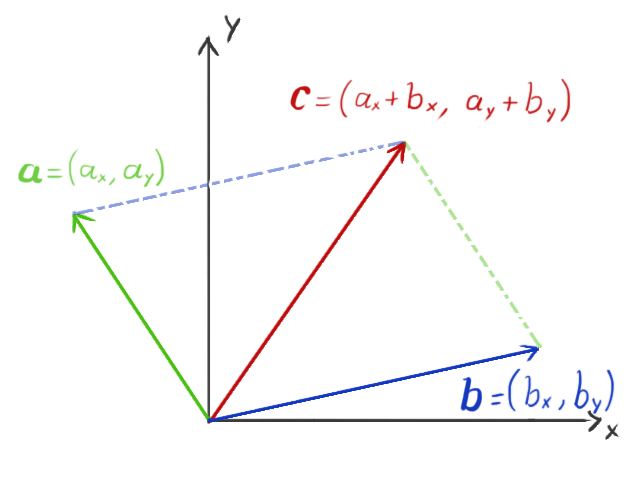 The result is a vector c that is orthogonal (perpendicular) to both a and b. If a and b are parallel, that is, the angle between them is zero or 180 degrees, c is going to be the zero vector, because sin 0 = sin 180 = 0. The direction of the result can be determined by the right hand rule. 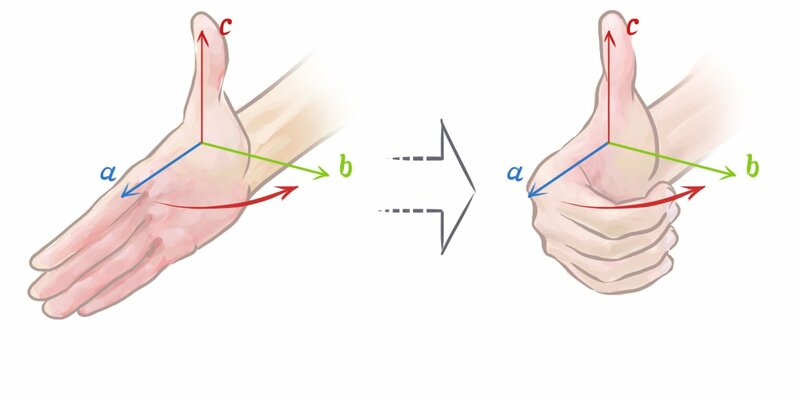 Open your right hand and point your index finger in the same direction of a and orient your hand in a way that when making a fist your fingers move straight towards b through the smallest angle between these vectors. Now your thumb is pointing in the direction of a × b. Where is the video??? Why is it realistic, need some proof to see it. This is going to be a very cool series. Definitely looking forward to reading the rest. Well done sir, well done! Looking forward to your next article! There is no video actually. Or, well, you can watch this https://www.youtube.com/watch?v=FiIZqOioRhQ. You can also download Box2D and play with the "testbed" yourself. It's a lot of fun! great article. will the next in the series continue with topics such as kinematic friction and air resistance? Math is cool. 3D Math is cooler! Thank you for sharing. It's great article. But I think f3 is parallel to the y-axis in graphic illustrates shape moving and rotating. Good eye! The changing direction of the force vector is intentional in this animation. Some forces would indeed have a constant direction, such a gravity (or antigravity! ), but many other forces change over time, as illustrated here. The third and last part will cover constraints, which can be used to simulate friction, air resistance, and many other things. Can you add a summary in the initial of the article ? Knowing this simple thing in Physics is still important for a student or a person can use some of the equation that it used in their solving activities that is also related in Physics. I don't really understand the part about turning particles into a shape do you litterally use a lot of particles as the outline or fill for a shape? Think of giving a shape to the particle, where the center of mass of the shape is the particle position. Hi. Thank you very much for this article, I've undertaken understanding 2 dimensional physics recently as a way to extend myself in programming and mathematics, and this article is definitely the greatest contributor to my current understanding. I have a question: Since I had struggled with this in the beginning, I thought using a step-by-step approach where I find scenarios that increase in complexity, and try to find a mathematical solution that is sound with my instinctive reasoning, would be a smart approach. I have reached the same scenario as one in this article with the box which has no velocity, and is pushed at its corner by some force. 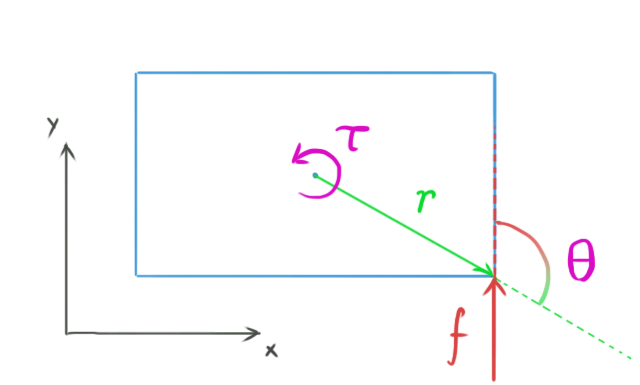 What I did to understand this outcome, was take a straight line - which could be imagined as the same box without width - with a centre of mass in the same position as the centre of its length, and imagine applying a force to its tip, with a direction perpendicular to the orientation of the line. My intuitive answer was that the line would just rotate at some speed around it's centre, and none of this force would affect the line's linear movement. Is this correct? I think that by adding width to the line... Some of the force would affect it's position, (but not all of it) and some would affect it's rotational orientation. How do you express this? Once again thank you very much for your article, I've read the second part also and I am yet to learn the mathematics involved in the final part. You have made this topic very easy to understand. To make things simpler is a talent not every genius have.